MS Roald Amundsen polar cruise ship will be delivered to Hurtigruten in July 2018. Image courtesy of Rolls-Royce. 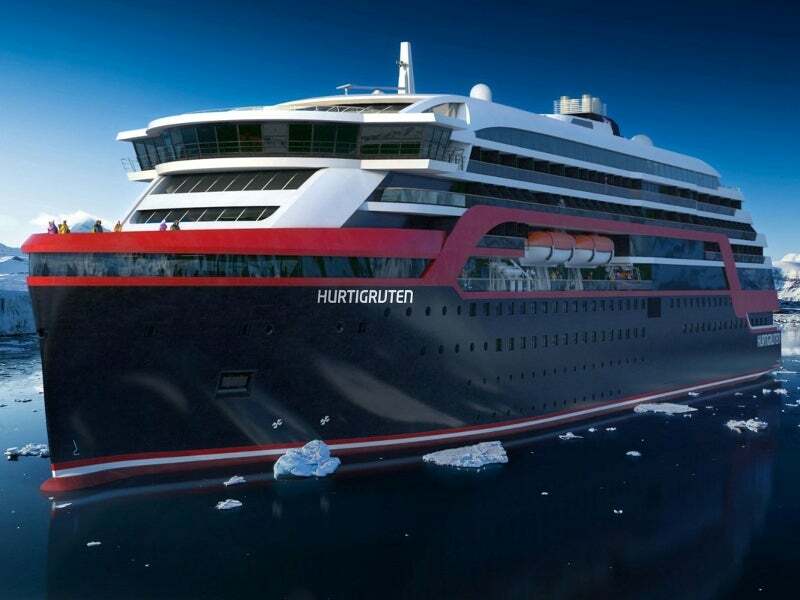 Two explorer cruise ships for Hurtigruten are currently under construction at Kleven shipyard. Image courtesy of Rolls-Royce. MS Roald Amundsen will be equipped with Rolls-Royce electric propulsion. Image courtesy of Rolls-Royce. MS Roald Amundsen is the first of two new explorer cruise ships being built by Kleven Maritime, for Norwegian explorer cruise line Hurtigruten. In April 2016, Hurtigruten signed a letter of intent (LoI) with Kleven shipyard for the construction of two new expedition ships. The LoI includes an option for the delivery of two more explorer ships. It was converted into a firm contract in July 2016. MS Roald Amundsen is scheduled to be delivered in July 2018, while the second vessel in class, MS Fridtjof Nansen, will be delivered in July 2019. Rolls-Royce received a £25m ($33m) contract from Kleven shipyard in July 2016 to provide vessel design and equipment for two new polar cruise vessels, with an option for two more vessels. The ship is purposefully designed to operate off the Norwegian coast and for expedition voyages in polar waters. The innovative ship design integrates an ice-strengthened hull and a wave piercing bow design. It will be equipped with the Rolls-Royce Unified Bridge incorporating an entirely redesigned consoles, levers and software interfaces offering safe and efficient working conditions. The new polar cruise ship will also integrate a DP0 dynamic positioning system, Aquarius 100 stabilisers and an ACON integrated automation system. It will have a length of 140m, width of 23m, height of 29m and a draught of 5.3m, and will accommodate 530 passengers. The onboard hybrid power solution in combination with the hull structure and efficient electric power systems will reduce the fuel burn by approximately 20% and CO2 discharges by 20%, which is equivalent to more than 3,000 metric tons of CO2 a year. The staterooms aboard the vessel will be divided into three major categories, namely Expedition suites, Arctic Superior class cabins, and Polar Outside cabins. The Expedition suites are further classified into XL suites with/without balconies, Large suite with balcony, and suite with balcony. The Expedition suites will accommodate up to four passengers and will be furnished with flexible sleeping arrangements, sofas, sitting areas and TV, an amenity kit, bathrobe and espresso maker. The Arctic Superior class cabins will be available in two categories, including high-deck cabins with balcony, and larger cabins without balcony. The rooms will feature a comfortable, spacious accommodation layout housing flexible sleeping arrangements, sofa beds, TV, an amenity kit, kettle, tea and coffee. Each cabin can accommodate two to four passengers. Deck 6 of the MS Roald Amundsen will house T. Aune main dining area, which will offer breakfast, lunch and dinner for guests. The Fredheim restaurant will also be located on the same deck. The ship will also feature a shop, photo centre, library, internet facility, science centre, lecture halls, pharmacy, hospital, compass service centre, as well as outdoor walking and explorer decks. The MS Roald Amundsen explorer cruise ship will be powered by an innovative hybrid solution including four Bergen B33:45 engines and batteries. The engines will be equipped with a selective catalytic reduction (SCR) system to meet the IMO Tier III nitrogen-oxide (NOx) emission limits. The fully electric propulsion will integrate two Azipull azimuth thrusters driven by permanent magnet (PM) motor and two tunnel thrusters. The PM motor will deliver high efficiency across different speeds and will minimise the space needed in the thruster room.